Yesterday was Chu Yi (1st day of Lunar March). I am not very good at cooking vegetarian dishes, seriously. So, I was really head scratching all the time when come to vegetarian days, twice a month. As weather was hot, I did not want to cook curry dishes. Just to keep it simple but filling, I had no choice but to fry rice, again.. Cooked this vegetarian fried rice improvised from my previous recipes, I think this fried rice turned out deliciously! Simple to cook and delicious to eat even if you are not a vegetarian. And, as usual, my fried rice wasn’t greasy since I used minimal amount of oil to cook it. To make my fried rice dish more fragrant and tasty, of course, I added the dark soy sauce which I’ve gotten from my last Hong Kong trip. 1) Break 1 egg into the cooled cooked rice, and mix till well coated. 2) Break 2 more eggs into bowl and stir in light soy sauce, sesame oil and pepper. Beat well. Heat wok with 1 tablespoon of oil over high heat, pour in egg solution and immediately scramble the semi cooked egg lightly from the surface of the wok using spatula. Continue to scramble till all the egg solution turn moist and light yellow scrambled egg. Use spatula to break into pieces before dish up. Set aside. Omit first 2 steps, if you do not consume egg. 3) Heat wok with oil over medium fire. Add long bean and carrot dices. Stir fry till fragrant and softened. 4) Add in rice. 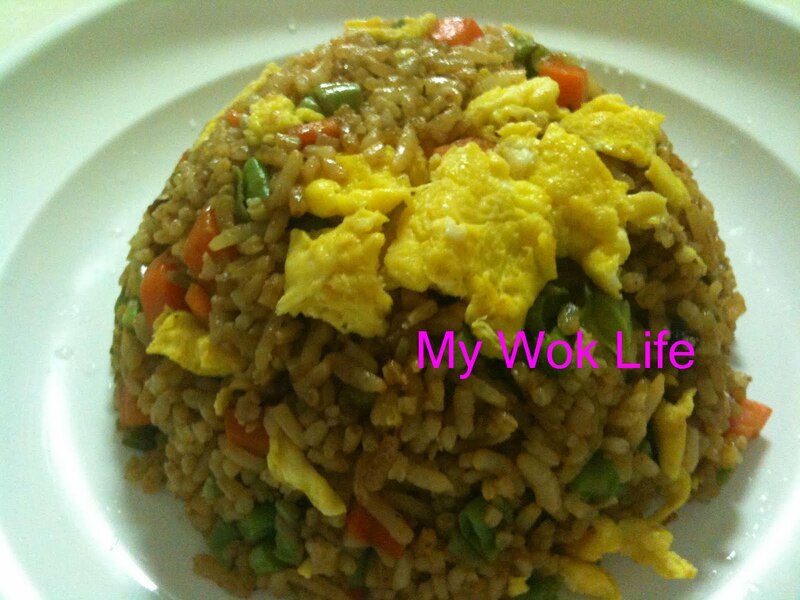 Loosen the rice a little with spatula, and stir fry to mix rice with vegetables. Add salt and pepper. Continue to stir fry for 2 minutes, and then, add in dark soy sauce. Stir fry to coat well. 5) Return egg pieces to wok and mix well. Reduce heat, and serve warm. A serving of my vegetarian fried rice counts about 400kcal. Tips: Stir fry the rice constantly to avoid sticking in wok. * Over-night rice is not necessary. I preferred fresh cooked rice. Simply add slightly less water into the rice pot when cook the rice in rice cooker. Then, remove from rice cooker and let it cool a little before use. This way, the rice will not be too moist for fried rice.